When asked about what the Quinnipiac men’s basketball team was doing to strengthen their offense in the last two games, point guard Rich Kelly’s answer was short, yet telling. After inconsistencies in scoring have led to the Bobcats mishandling some winnable games, the team has turned in two of its most impressive offensive performances in back-to-back games – 92 points against Marist on Friday and 77 points on 50 percent shooting in a win against Saint Peter’s on Sunday. 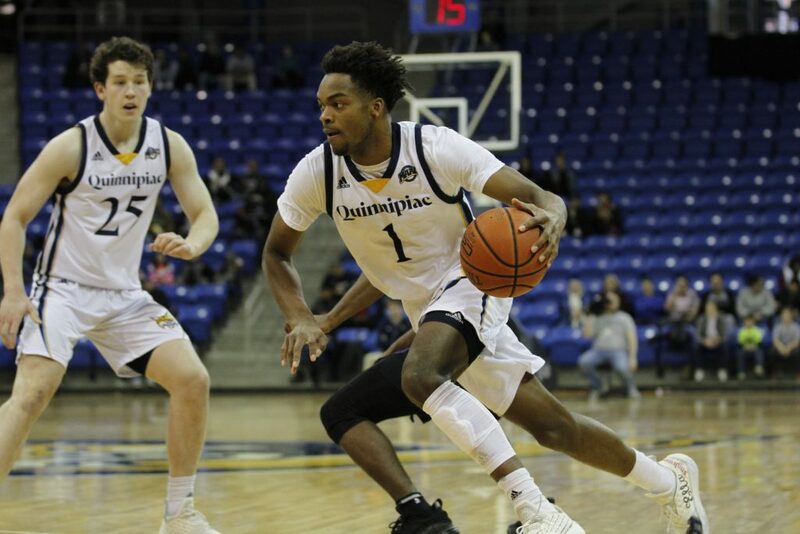 Graduate student Cam Young, Quinnipiac’s top scoring option and Kelly’s partner in the backcourt, has paced those wins, with 57 points over that two-game stretch. The latter of those two games, a 77-58 victory for Quinnipiac (10-9, 5-3 MAAC) over the Saint Peter’s Peacocks (6-13, 3-4 MAAC) saw Young lead the way yet again, dishing out three assists and shooting 7-for-12 in a 29-point performance. Though it’s not unusual for Young to lead the way for Quinnipiac, Sunday’s contest with Saint Peter’s carried more meaning than just another regular conference game. With 3:28 remaining in the first half, Young pulled the trigger from deep and buried his third three-pointer of the game. The triple marked the 1,000th point of Young’s Quinnipiac career – a tally that took him only 58 games in a Bobcat uniform to reach. Young wasn’t the only one shining on Sunday – freshman Tyrese Williams was given the tough assignment of guarding Davauhnte Turner, the MAAC’s second leading scorer. He limited Turner to 15 points on 7-for-18 shooting, including 1-for-5 from deep, neutralizing the Peacocks’ most dynamic offensive player. Also making a large contribution for the Bobcats was big man Kevin Marfo, who, despite working back from a partially torn meniscus, scored nine points and pulled down five rebounds in just thirteen minutes with the second unit. “Kevin makes a big impact. He’s on a minutes restriction right now, but he was able to continue to give us that physical interior presence which, at times defensively, we really lacked when he was out,” said Dunleavy on his 6’8” center. The big names for the Bobcats put up big lines, but contributions came flying from everyone on the floor. Sophomore forward Jacob Rigoni re-found his stroke and poured in 16 points, Kelly handed out six assists, and the team only sent the Peacocks to the free throw line ten times. In fact, Dunleavy said what he saw was the most consistent game he has seen from his team all season. “I thought for our team, this was a good step for us in terms of consistency over forty minutes… I thought it was a complete game for us. As a coach, I’ll find things to nit-pick about, but that’s as complete a game as we’ve had,” Dunleavy said. The Bobcats have little time to relish on the victory, as they face a tall task in their next game – a trip to Buffalo, N.Y. to take on the Canisius Golden Griffins on Friday, February 1. The tip for that game is scheduled for 7 p.m.